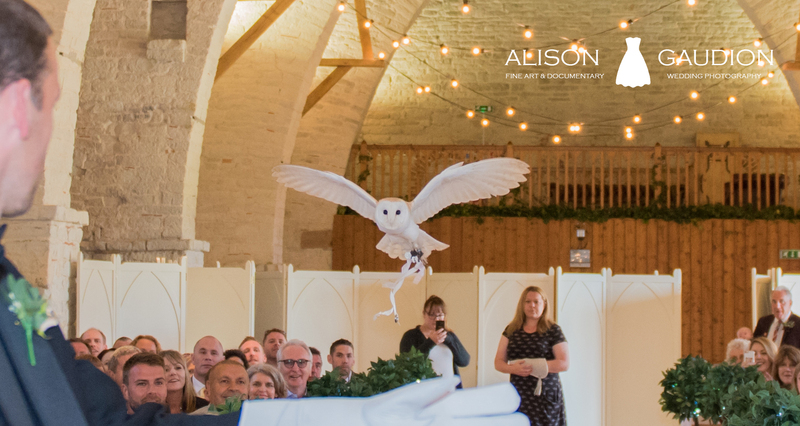 So, when the couple said their wedding rings were to be flown down the aisle by owls, I was excited. 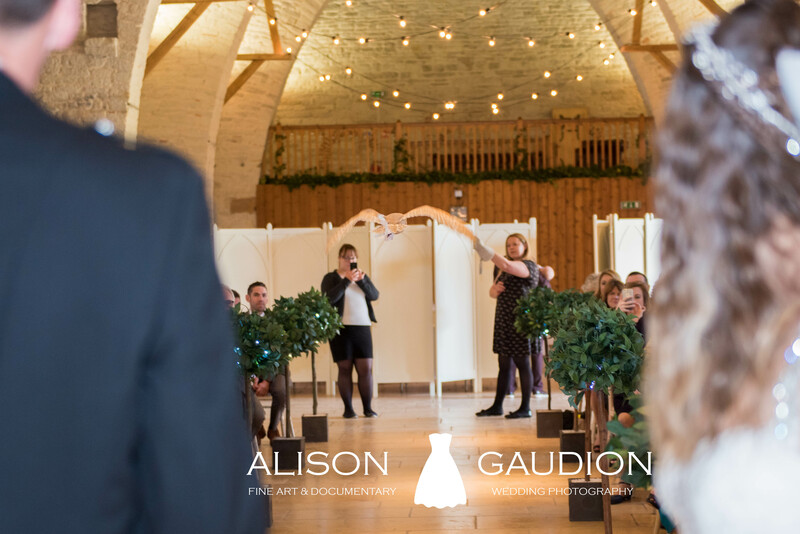 They were getting married at The Tithe Barn in Petersfield, which is massive. It’s has very super high gothic arches, not unlike a church. I just had pictures of the owl going straight up into the rafters. Perhaps sitting up there all day with said wedding rings. I was hoping that they might do something naughty. 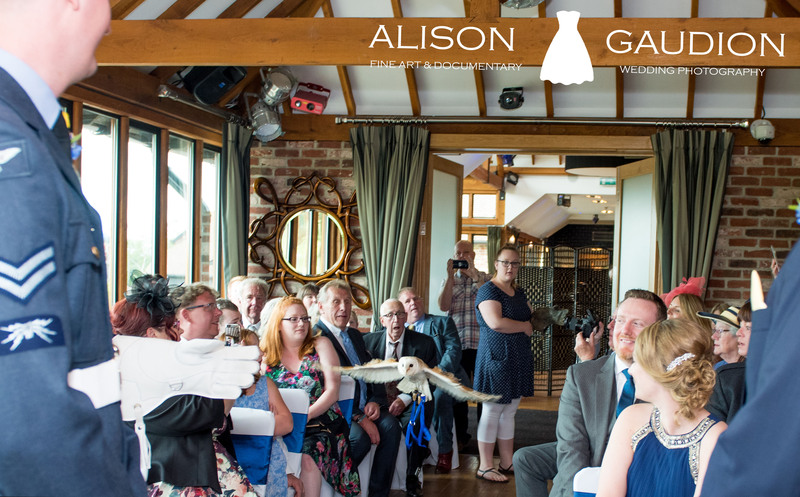 As a wedding photographer, who has photographed around about 400 weddings in the West Sussex, Hampshire area, its quite fun. 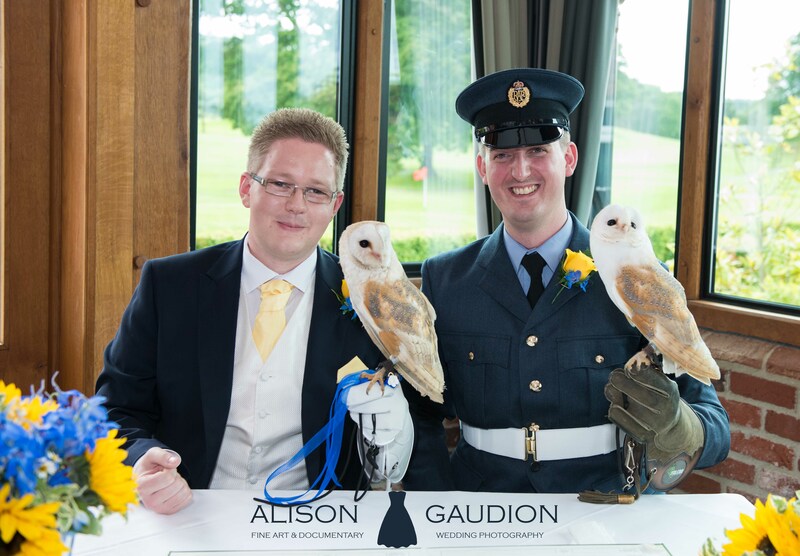 I have never seen the owls delivering wedding rings, ever … so, this was new to me! 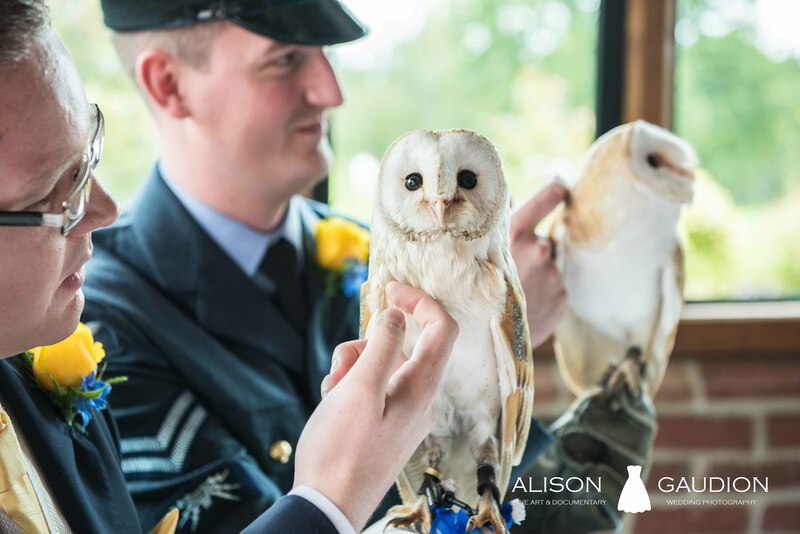 So, CSR Falconry http://www.csrfalconry.co.uk/ are the company who have owls to deliver wedding rings. They are very professional and they stay at the end of the aisle and come out of a hiding place right at the correct moment. When the registrar says, now does the bestman have the rings? It’s quite fun, when he says no. 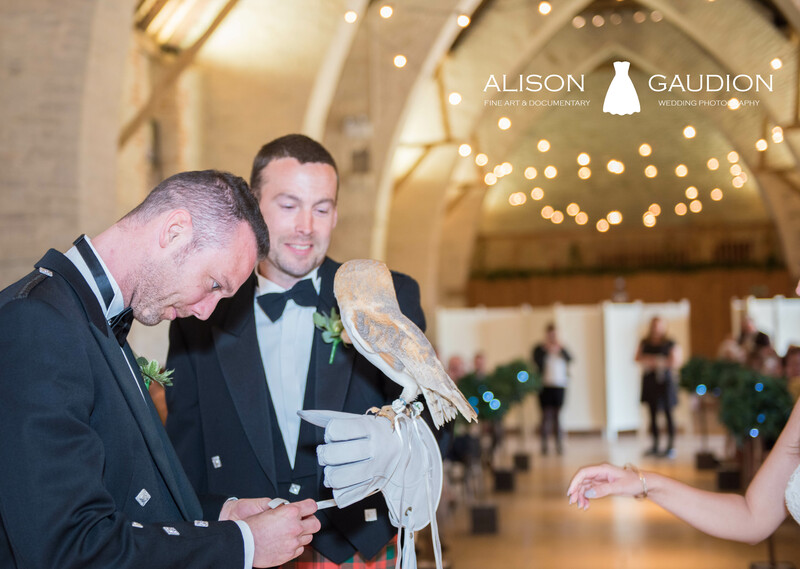 The guests are usually surprised and have no idea that the owls are going to fly the rings up the aisle. The CSR Falconry lady, Clare, has two birds, one to fly and one other to be held afterwards. As soon as the bestman says, “no, I don’t have the wedding rings”. 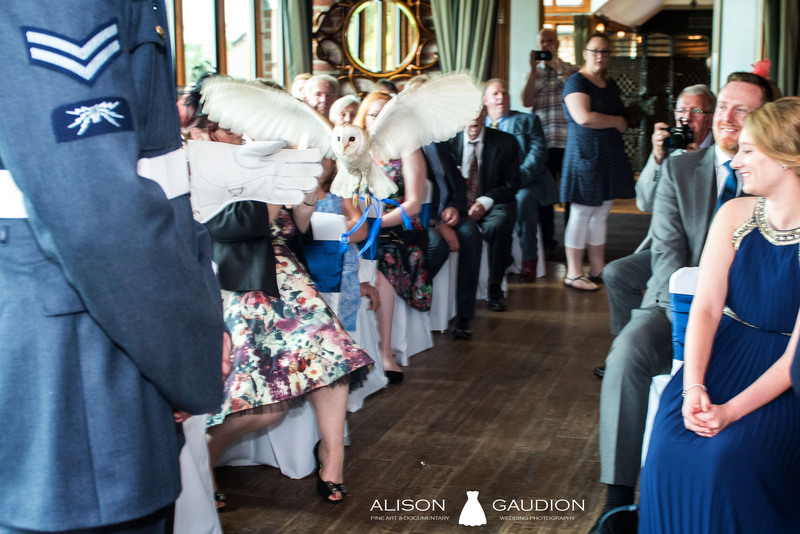 The Groom puts on a leather glove and the CSR Falconry lady lets the owl free. 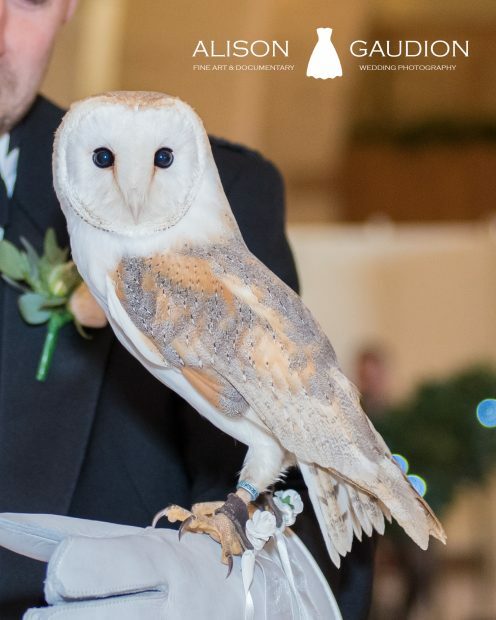 The owl has the rings tied to his claws and he lands on the Groom’s glove, usually must to the hilarity of the crowd. Look at the bestman to the left in the photos below; hysterical. I also shot two Grooms’ wedding at the Old Thorns Hotel. As a wedding photographer, I’m always amazed at how organised the staff are up at Old Thorns. They can have 3 weddings go on a the same time and cater for them all. 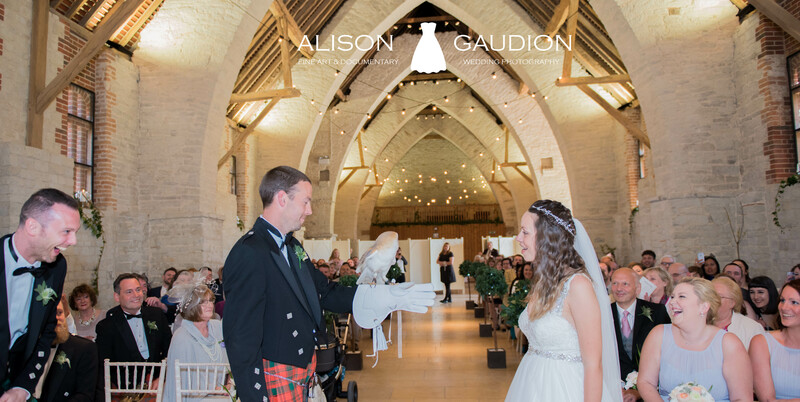 So, when they opened the doors, the crowd were in awe of this beautiful white owl, which arrived through the doors to deliver the rings. One ring came off just as it made it to the Groom’s glove and fell on the floor much to everyone’s delight. It all added to the drama.